This is segment two of an interview with James Early and Sujatha Fernandes. We’re talking about the implications the new relations between Cuba and the United States will have on the Cuban people. So, again joining us from New York, New York, is Sujatha Fernandes. She is professor of sociology at Queens College and the graduate Center at CUNY. She’s the author of several books, including Cuba Represent! And joining us from Washington, D.C., is James Early. James is the director of Cultural Heritage Policy at the Smithsonian Institute. But James has spent the better half of the last several decades going back and forth between Cuba and the U.S., forging cultural partnerships. And he’s also a board member of The Real News Network. PERIES: So, before we get into unpacking what I want to do in this segment, which is the economic and social implications this decision has, let’s talk about the Cuban Five, which was a fairly pivotal moment in this latest announcement and in reestablishing relations between the two countries, which was essentially a spy swap. So, James, tell us more about that, because you’ve been very involved in trying to get the Cuban Five released. And some of them were. Others remained, but they were a part of this announcement. Tell us more. EARLY: The exchange of the Cuban Five for Gross, who was brought down under the general auspices of USAID, was a tremendous victory for Cuban statecraft, recalling that Fidel Castro had promised many years ago that the Cuban Five would return. That was not prescient on his part, but it was an indication of high–high the Cuban government held the importance of protecting their citizens against terrorism and a commitment that in whatever the relationship of the United States going forward, that the release of the Cuban five would be an indispensable element. So it was a major victory on the part of the endurance of the Cuban people and the statecraft of the Cuban government. It was also significant for the Obama administration, which does not fully own up to the role of USAID, as they’ve indicated that USAID will continue in its democracy programs directed towards Cuba. But it was a conciliation on the part of the Obama administration to swap Alan Gross in this process, which at least the mainstream press had been saying in the U.S. was a major block in improving U.S.-Cuba relations. PERIES: And, Sujatha, earlier we talked about the diplomatic pressure brought on by various Latin American and other countries around the world in terms of improving relations with Cuba. But the Cuban Five also played a very important role, and the pressure that that case, those cases brought about on the United States. Tell us more about that. FERNANDES: Well, I think James could probably speak more to that. It’s not really something that I’ve followed as much. But I do think that one of the things that was really interesting was in some ways when this normalization of relations was announced in Cuba and the release of the Cuban Five was announced in Cuba, there was always more excitement, from what I’ve heard about the release of the Cuban Five. And this seemed to be, for many people, a really big deal. And from what I’ve heard, people said, well, then, after that, then we sort of absorb the fact that there’s going to be diplomatic relations with the U.S. and there’s going to be in embassy here. And then that sort of started to sink in as well. But I think we can’t underestimate just how important this was, this release of the remaining three Cubans. PERIES: I was just going to say, James, James, you were playing a role in a international campaign to have the Cuban Five released. Talk about some of the nuances of that. EARLY: Well, I would say that I’m one of the minor citizen players. I mean, there were many, many stalwarts here in the United States, and my role was really rather insignificant, although I’ve been consistently involved. But the late Saul Landau, for example, his last film, [Will the Real Terrorist Please Stand Up? ], was crucially important of that. He and Danny Glover–Danny Glover is perhaps the actor-activist, also board member of The Real News Network, who’s perhaps the most noted face and heard voice on the Cuban Five. And then there were Nobel laureates around the world and jurist around the world, and elected officials, and just ordinary people that perhaps went into the millions, actually, when you look at the global organizing. It was a very sophisticated, organized campaign. For those who have not been to Cuba, it is commonplace in Cuba to see the Cuban Five not only posters, but text panels with accessible information of who they are in virtually any restaurant that you go into, a hotel that you go into. So the Cuban government had propagated the importance of this defense on the part of the Cuban Five for the integrity of Cuba widely within the community. And I think Sujatha’s point of the elation shown about the Cuban Five in the overall context of the announcement of normalization is one of the indications of how socialized and engaged the Cuban citizens at large are around this issue. And, of course, all across Latin America, including Pope Frances, had called for the release of the Cuban Five. So this was a tremendous victory against terrorism, hopefully, although the U.S. has indicated that the USAID will not cease in its quote-unquote democracy programs towards Cuba, under which Alan Gross was recruited and under which other surreptitious to undermine the Cuban state, like with Cuban hip-hop artist, has been a poignant area of contention. PERIES: Alright. Elaborate on that a bit more, James, this particular USAID program, which also has been a point of coverage in the media these days. FERNANDES: –and between 2009 and 2010, USAID reached out to a number of artists on the island and began this program of attempting to so-called spark a hip-hop movement against the Cuban government. And they were revealed because they were unsuccessful, as we would imagine that they would be, in trying to make anything happen. 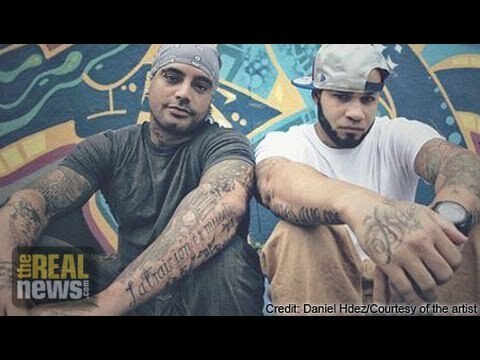 All of their attempts to really manipulate Cuban rappers, to manipulate the scene, to put people at risk, to–all of the things that they did were revealed through an AP report that came out a couple of weeks ago. And I think what’s really quite stunning about this attempt is that the Cuban rap movement and its evolution over the last ten, 15 years has never had anything common with USAID’s idea of democracy promotion, which is pretty much put in a free market regime that’s friendly to the United States. Cuban rappers’ idea of democracy has always been about greater participation in society, i’s been about recognition, i’s been about bringing up and raising questions such as race, it’s been about asking the state to live up to its promises, and not overthrowing the state, which is what the aim of USAID program was. And so it was fatally doomed from the beginning. It was revealed to be a farce. And that’s why I do think it’s interesting that they’re not letting go of the idea that USAID should continue to do work there, because, as James and I have both said, there are many areas in Cuban society where there’s already critical thinking and participatory democracy taking place. And they don’t need USAID to come in and stoke that. EARLY: You should go find Sujatha’s article. I’m going to ask her just to cite the article. I just recently read it. But I think it’s really important people go to see it, because it’s not just about hip-hop, but I think, as she points out, it is about the expression, both in favor and/or critique and/or with regard to recommendations, coming out of the artistic community, particularly the singing/rap community. These citizen artists have perhaps played a more overt role in a review and a critique of the state openly than any other sector of the citizenry. And this was fostered largely not only on their own initiative, but by the support of the Ministry of Culture, particularly the former minister, who was a poet and painter, whose name is escaping me for–. EARLY: Yeah, Abel Prieto, who is now one of the counselors to Raúl Castro. PERIES: Right. So both Raúl Castro, and now Fidel Castro, has indicated that while diplomatic relations with the United States would improve and be reestablished, the socialist program of Cuba will continue. What impact do you think this decision will have on the ability of Cuba to continue a socialist-driven state? FERNANDES: Well, I think it depends what you mean by socialist, because that can mean many things. It’s often used by the Cuban government to talk about a more collectively based society, a more publicly managed society. And that’s something that I think the achievements of the revolution in health care and education, the ways that these are publicly funded and available to Cuban citizens, I think, is going to be absolutely crucial to keep in place, as, even while elements of the market economy have been entering the society since the period of the ’90s and probably will continue to after this this announcement was made, I think that that aspect of this publicly managed economy is going to be very vital towards the continuing achievements of the revolution in terms of not widening the income gap any further, not widening class and racial divisions in the country. I think that James was just talking a little bit about discussions within the Communist Party, and I think perhaps he could elaborate on that some more. EARLY: Well, I think this–. PERIES: James, James, yeah, go ahead, jump in. EARLY: I think this normalization is going to have a huge impact. But I think, particularly for U.S. and/or other non-Cuban viewers of this program, that it’s always important to start with the optics and the voices and the ears of how Cubans are debating and criticizing and negotiating their own internal circumstances. We should not drop our own views, but we should not start with our own views as the mainstream press, both liberals and conservatives, do about taking democracy to Cuba. Keep in mind that it’s only been about three years or so ago that Fidel Castro himself said this system is not working, that Raúl Castro, when he was nominated and elected to the head of the National Assembly, said that you could take this blockade away tomorrow; we’d still have huge problems; our wounds are self-inflicted; so that an internal critical process was already underway. Even stepping further back, the late Hugo Chávez announced, proclaimed that 21st century socialism must be democratic, that is, it must be elected, and it must be plural, that is, that it must be derived from its own internal deliberations and not from some textbook pattern, so that their frameworks that have accumulated here that now intersect with this normalization process–. The Cuban Communist Party and the Cuban state have been a big debates about difference between the party and the state, and between the state and the people, and that the explicit decentralization of ministries into private enterprises is an indication of a democratic process evolving slowly but surely. The pressures now removed in the steps that have been taken towards normalization will allow them to focus more internally, to deepen, hopefully, and move that process along. But it also brings a lot of potential contradictions, as Sujatha has pointed out. Cuba has a huge debate about race and racism (their terms, not mine; this is their use of the term), that racism has been stubborn. It is being perpetuated there /ˈθisɪsɪz/ within the family. And you can see the differentials that hvae already taken place with regard to remittances. The Cubans who left Cuba were not the darker complexioned black or brown, but the lighter. And that does not equate with class outlook, but in some instances it does. So, in sending familial remittances back, you can begin to see a widening sociology based on the color line, and so that with this new opening and funding coming in, the Cuban state is going to have to take particular affirmative measures–a term that they’ve had problems with, except when it came to pinpointing the role of women and the limitations on women because of chauvinism. And now they probably point to something like 69 percent of technical positions are occupied by women. Raúl Castro is proud to say frequently that this revolution needs more women. Well, they’ve not done that on the question of race. And so that’s something that they’ve got to look at, because it intersects historically with the issue of class. And then it goes beyond, even for those who are working-class blacks who have benefited from the revolution, their access to jobs are limited in certain areas like tourism because of the color of their skin, despite the merit of their educational background. PERIES: So, Sujatha, tell us a little bit about why the racial divide in Cuba has continued under this socialist structure. FERNANDES: Well, after the revolution there were a lot of measures that were taken to desegregate, to desegregate public space, to involve Afro Cubans, to give them housing. And many entered into this professional sphere. They entered into education. They moved into better housing. And there were a lot of changes that took place under the Cuban Revolution for Afro Cubans, even though at the same time that all these changes took place the black press was closed down and there was this idea that we don’t need to have Afro Cubans to have an independent political voice anymore, because racism doesn’t exist. Through the Revolution, we’ve got rid of racism. Fidel Castro said that. Many people believe that this was the end of racism, and so there’s no need for Afro Cubans to have any independent kind of organizational movement. And racism didn’t go away. It’s not that easy to just simply get rid of it over the course of a few decades. And so it was there. It was often in the private spaces. It was in–as people have said, it did still continue to structure work relationships, even though capitalist relations were gotten rid of. And what happened was, in the ’90s, when Cuba opened up to a global economy through its tourism, through joint investments and other areas, that these racial relations began to structure the way that change was taking place in Cuba. And so the racial gap began widening. You began to get much more sort of explicit racial discrimination. And this is at the same point in the late ’90s when the hip-hop movement starts to emerge as one voice for black youth on the island to talk openly about racism and to really force it back into public consciousness, which, together with intellectuals, together with activists, together with a range of groups, they really did make racial discrimination visible once again. EARLY: And Harry Belafonte played an important complimentary role (I want to underscore complementary role) in interacting with Cuban rappers who, when he asked, so what are your principal themes, and they said racism and the police–. And he happened that very same day to have had scheduled what was to be a 45-minute lunch with his old friend Fidel Castro. And when Fidel asked him what he was up to, he says, I think I’m in your business. And he described these young rappers that he has met. And six months later, there was a state rap agency, which was a positive step forward on the point of these marginalized black voices becoming active in the state, but also a major challenge as to how they could balance the critical voice with now the responsibility of the agency of the state. So some stepped in, some stepped out. But it again was the artist, the citizen artist/intellectual, because these are not just feel-good artists. They have really articulate reviews of a society and history and culture that is brought together with a powerful aesthetic on the dance floor. And so the issue of racism is really key. Some would argue–and I certainly would agree with this–that the issue of race is the major social factor as a vetter on the revolution today. And if they do not confront this with very special or affirmative or attentive measures–whatever terminology. But the stubbornness of it is going to cause increased friction. And they’ve got to confront the ideological views, particularly within certain cultural elites and certain elements of the Cuban Communist Party that argue in this abstract humanistic view that Africa is the cradle of civilization, therefore they are all Afro descendants, which then obscures the actual history of racial discrimination and the contemporary expressions of racial discrimination. PERIES: Right–important point, which I hope to take up in terms of our continued discussion in the next year with the two of you.